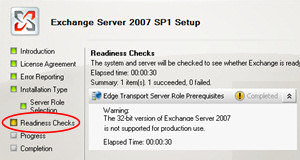 In Exchange 2007, the Edge Transport server is in different category from the other roles. It has special requirements because it’s outside of your Active Directory, and it’s also on the external side of your firewall. The following outline and screenshots were kindly supplied by Alain Laventure. If you keep in mind that the purpose of the Edge role is security, then the reasons behind these particular and precise requirements, become clearer. Remember that you need 64-bit hardware when you install the underlying operating system on, either Windows Server 2008, or Windows Server 2003. As for the placement of your Edge Transport Server, it should be in the perimeter network, and certainly outside the main network firewall. Workgroup – You should prepare a stand-alone server for the Edge Transport Role. The Edge server is exposed to the internet, and because it’s running Exchange 2007 server, it becomes a likely target for hackers and spammers. Thus, if this Edge server in a workgroup then it has no information about your domain, and consequently, your administrative usernames and passwords cannot be compromised. ADAM (Active Directory Application Mode) – If you have ever wondered what was the point of this alternative active directory, then planning the Edge server will act as a case study for the use of ADAM. Note, in Windows Server 2008 the equivalent of ADAM is AD LDS (Active Directory Lightweight Directory Services). The point is that although the Edge server is in a workgroup, it still needs a few basic Active Directory capabilities, in particular, it needs to know how to send (forward) appropriate email to your domain recipients. Insert the Exchange 2007 setup disk. Install (Add) the Edge Server Role. Take the time for a Readiness Check. EdgeSync – Remember that the Edge Transport server doesn’t have access to your domain’s Active Directory directory service. The role of Microsoft’s EdgeSync is to copy a subset of Active Directory information and ‘paste’ it into the Edge server’s directory service (AD LDS or ADAM). Rest assured, EdgeSync does not send any information back to Active Directory, thus there is no backdoor for hackers to exploit. During this one-way transfer, only a specialist sub-set of Active Directory gets copied, mainly data about the connection configuration, but also anti-spam information. Without this information the Edge server would not know where to send incoming email, which is addressed to your Exchange 2007 recipients. 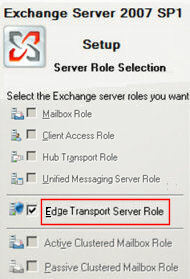 Hub Server Role – The Edge Server communicates with one of the internal Exchange 2007 servers that has the Hub Server Role. Specifically, the Edge Rules agent filters unwanted messages and thus reduces the spam that enters your Exchange organization. 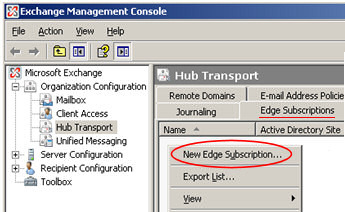 To manage the Edge Rules agent, launch the Exchange Management Console. Experiment with different conditions, exceptions, actions, and the scope until you have the desired level of filtering. Edge Subscriptions – You can manage the Edge subscription and synchronization processes with the EdgeSubscription family of PowerShell cmdlets. To setup subscriptions follow this export –> import sequence. Copy the file EdgeSubscriptionFile.xml from the Edge server. Open the Exchange Management Console, expand the Organization Configuration and select Hub Transport. Now you are ready to call the New Edge Subscription wizard, browse for the filename (EdgeSubscriptionFile.xml), the wizard will complete the subscription. Edge Transport DNS – This server sees every message that comes into your organization. You should also configure DNS so that your domain’s external Mail Exchange (MX) record points to the Edge Server. Once all the components are configured, Exchange 2007 automatically routes outgoing mail through the Edge Transport Service. Redundancy There is no reason (other than cost) not to install a second Edge Transport Server; the benefits would be redundancy, and possibly load balancing. Check the Transport Layer Security (TLS) check box. Check the Exchange Server authentication check box. Check that you have an inbound message queue for an accepted domain, such as "MyCompany.com", and if there is an error similar to "451 4.4.0 DNS Query Failed". Select the Edge server in the Result pane, and then select Properties. Find the Internal DNS Lookups tab. If you have multiple NIC adapters, select the one is for the internal network, select ‘Use network card DNS settings’. The IP addresses will magically populate the box with the DNS server IP addresses from the internal network card. Don’t reboot, but Restart the Transport service. You can select ‘Use these DNS servers’ and then select the IP address of the internal DNS server. Alternatively, you can add a host file containing the DNS server information. In a nutshell, the Edge Transport Server is your Exchange 2007 security outpost. Thus, it is best to deploy this server in your organization’s perimeter network. For these security reasons, it makes sense to install the Edge role on a stand-alone server in a Workgroup. This Edge Transport server then communicates with the Hub Server, (which has Active Directory) through the EdgeSync service. Alain Laventure provided the screenshots, the detailed steps and the background for this article on the Edge Transport Server Role.